Old George Brown himself would be proud. There has been distilling on the Woodford Reserve Distillery site for more than 235 years, making it the oldest Bourbon distillery in Kentucky. Now owned by Brown-Forman — one of America’s largest wine and spirits companies — it has been refitted and set to expand. Since the beginning, the folks at Woodford have been influential in the development and codifying of Bourbon production. In short, they helped invent the spirit as we know and love it today. 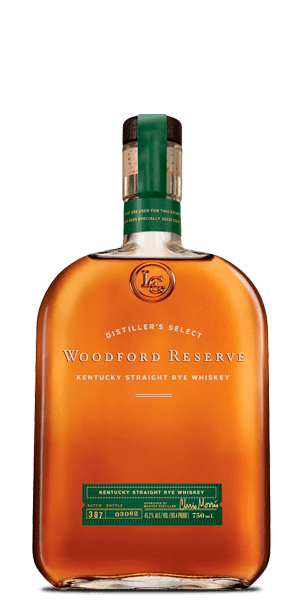 Smooth, pleasantly spiced, and bursting with flavor, Woodford Rye is a Kentucky Straight Rye Whiskey that is at least four years old. The mash bill comes in at 53% rye, 33% corn, and 14% malt. Why 53%? Because that what it needs to be. And it’s bottled at an interesting 45.2% ABV. It wasn’t until 2015 that Woodford even made a Rye Whiskey, and the oddly precise numbers in the grain mix and ABV are evidence that they were focused more on taste and less on the math. And we think that they got the taste spot-on. Woodford Reserve Distillery is named after the county where it’s located. But two-hundred odd years ago, founder Elijah Pepper named the distillery after his son, calling it the Oscar Pepper Distillery. What does Woodford Reserve Kentucky Straight Rye Whiskey taste like? The Flavor Spiral™ shows the most common flavors that you'll taste in Woodford Reserve Kentucky Straight Rye Whiskey and gives you a chance to have a taste of it before actually tasting it. Relatively smooth but too much spice at the end. Had it on the rocks and by the time some of the ice had melted it became more drinkable. This is a good, balanced rye. It drinks much like a bourbon, with a bit of spice and that rye kick at the back. I prefer more of a true rye (the mash bill on this is 51% rye), but it's a good entry point for new rye drinkers. My wife said she doesn't like rye, but after trying this, it opened her eyes to it. This would be a good rye to keep on hand for cocktails or even a neat sip when you want a bit of spice beyond a typical bourbon. We enjoyed it and would purchase again. Not much nose to this whiskey, feels and tastes more like a semi-spicy bourbon. If you are looking for a more peppery/spicy rye, look elsewhere. But for the price it is not too shabby! Decent flavor but there’s a lot of pepper in this bottle. Better on ice. Haven’t tried in a cocktail yet. I’d buy again for the right price. Incredible and extremely unlike a rye. If you need an intro to rye and want something unique. This one is it! Smooth, cinnamon, light spice, refreshing apple, not spicy at all, slightly buttery. To me, this is bar-non the best Woodford product ever! Very balanced and approachable rye. Spicy, buttery and smooth. A great everyday rye. Smells like a new cedar chest, with a faint apple. Starts off with pepper, rye and finishes nice. This is my absolute go to rye, and sets the bar for all of my ryes. I drink it neat, as I do with all my bourbons. No wonder (I try to) keep a liter of it at all times! Sweet to start, peppery to end. A go-to Rye. Very satisfying alone or as the base of a classic rye cocktail. Can be very sweet upfront. Finishes off with a peppery bite. Not bad. One of my go-to bourbons. Has a bite up front, but the mellow flavors rise pleasantly as the bite subsides. Sweet caramel is very strong. Good, easy to drink bourbon. Not as smooth as I expected. Probably the best tasting rye on the market that is easy to find and for a decent price! Very basic, standard rye whiskey, nothing to write home about. Smooth with a slight bite of pepper. I really enjoy this straight or mixed. Admittedly, I am new to rye, but this is one I greatly enjoyed. While not featured on the spiral, I swear I tasted chocolate in addition to the nutty flavors that abound. Smooth with an awesome kick of black pepper. Very smooth. This is a Rye that Bourbon lovers should try! Really smooth, easy drinking. I strongly recommend it. Good flavor, nice and smooth. bought as a gift, so no review, but he did say he liked it a lot. My first rye whiskey. Not a huge fan of rye flavor in general, but this is very smooth. An excellent, smooth, crisp rye. Straight or Single Malt: What's the Difference?